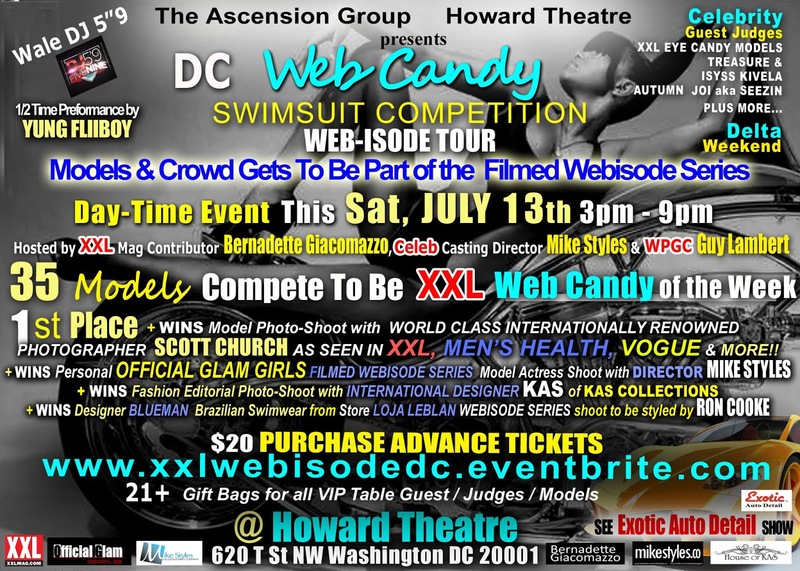 Coverage: XXL Web Candy Swimsuit Competition Oficial Glam Girls Webisode Tour - DC | BlackRadioIsBack.com - Official Blog of the Syndicated FuseBox Radio Broadcast! During the weekend of July 13, 2013 at The Howard Theatre in Washington, DC, the FuseBox Radio Broadcast/BlackRadioIsBack.com crew went out to cover the 2nd Annual DC Web Candy Competition held by The Ascension Group, Official Glam Girls and XXL Magazine. Hosted by celebrity casting director Mike Styles, XXL Magazine contributor Bernadette Giacomazzo and WPGC-FM radio personality Guy Lambert, the event featured various celebrity guest judges, an exotic car exhibition outside the venue, music provided by DJ 5'9" (Wale's Official DJ) and a live half-time performance by the fast-climbing independent Hip-Hop MC Yung Fliiboy. We were able to get a lot of quality pictures of the event from the all of the models (right up to the Eye Candy winner being photographed by world-renowned photographer Scott Church), the various music performances and more...hope everyone enjoys them!